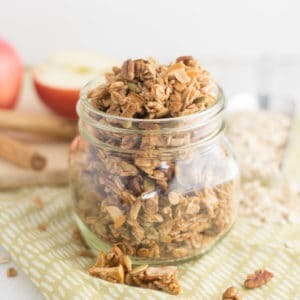 Nuts and seeds enrobed in maple syrup and cinnamon makes the most delicious and versatile granola recipe ever! 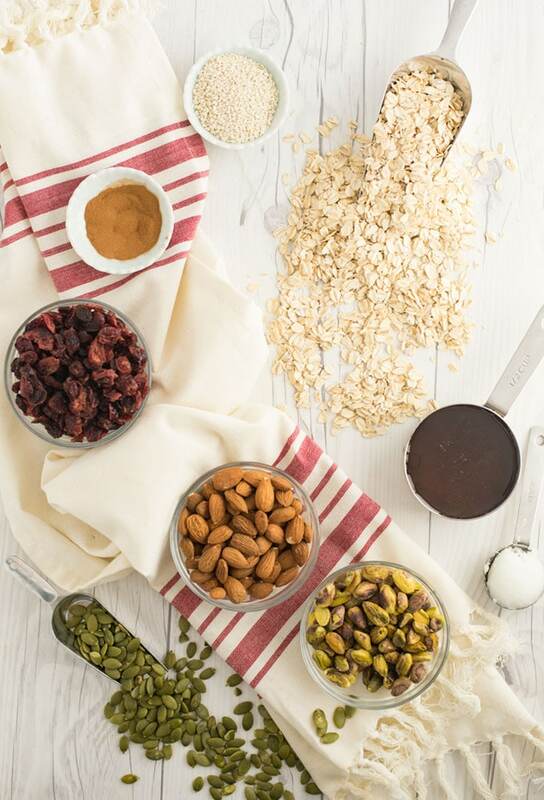 Top your favorite yogurt or smoothie bowls with this healthy granola. 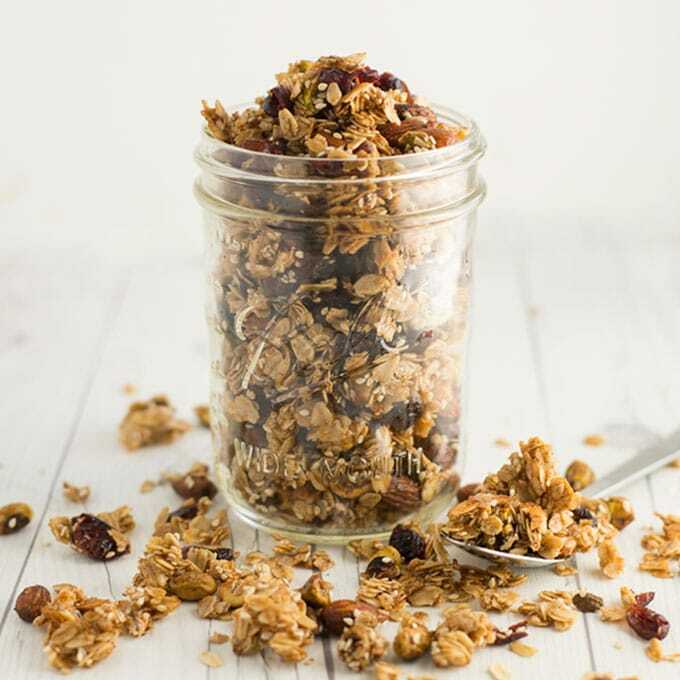 Have you ever tried making homemade granola? It’s like, super easy. It’s so cost-effective to make and you can customize it however you want. Watching your sugar intake? You can adjust that. Watching your oil? You can adjust that. Have a gluten or nut allergy? You can adjust that. Not really BUT you can create a granola to suit your needs. I think you get the idea. 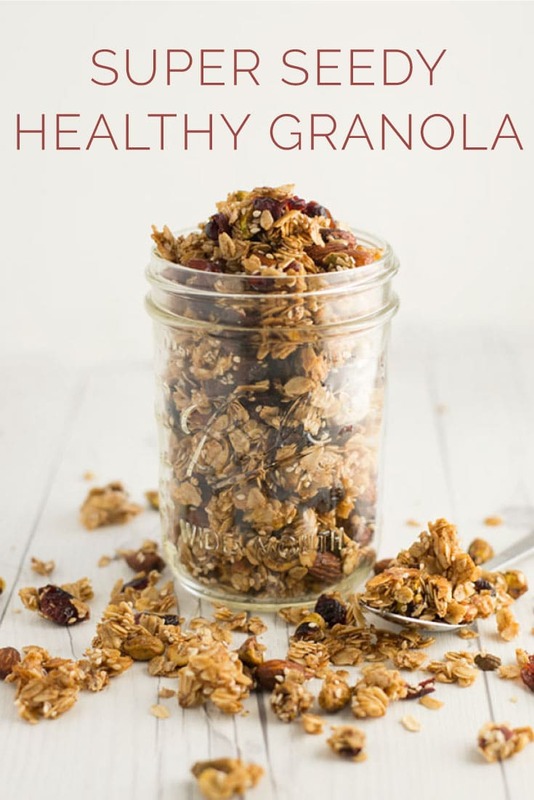 Granola is so simple to make and you can make loads of granola for a fraction of the price of a tiny bag from the grocery store. Plus, it makes your house smell amazing. Perks of making homemade food! 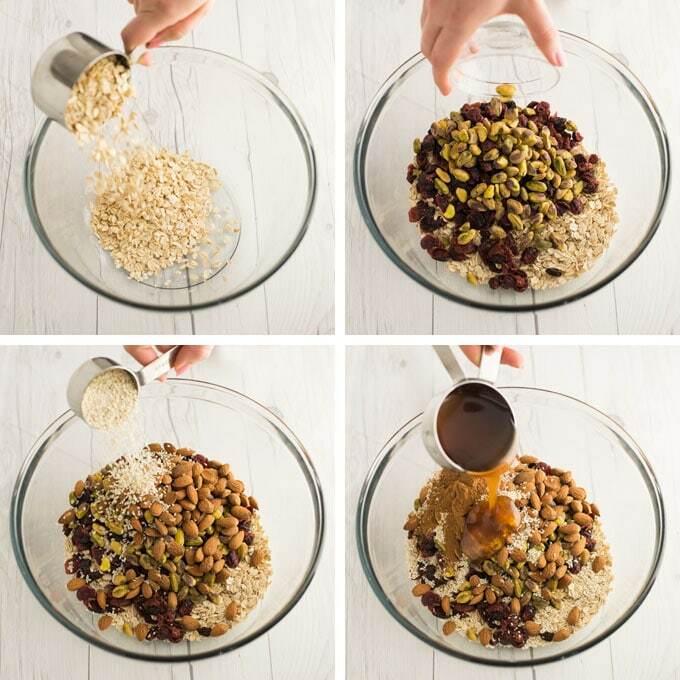 What I love about granola is there isn’t a cookie cutter, one size fits all recipe. You can adjust the ingredients to your liking. I personally love making granola when I have bits of ingredients leftover from recipes and I don’t know what to do with them. Do not mix when baking. When you turn the granola when baking, you break up the chunks that we all love. Just let it bake and do it’s thing. Bake low and slow. The oven temperature should be low and the cook time is longer. This allows the granola to bake to crunchy, golden-y perfection. Let cool completely. 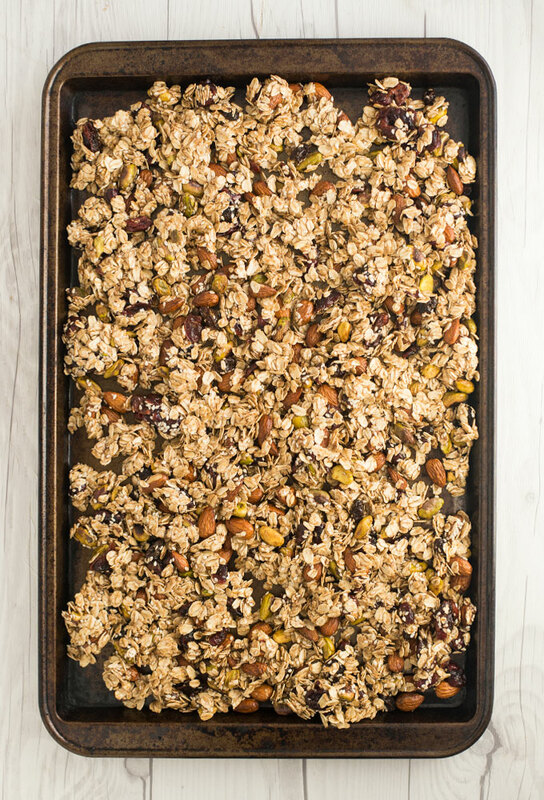 When done baking, let the granola cool completely before transferring or handling. If the granola is still warm, you will break up those precious chunks! 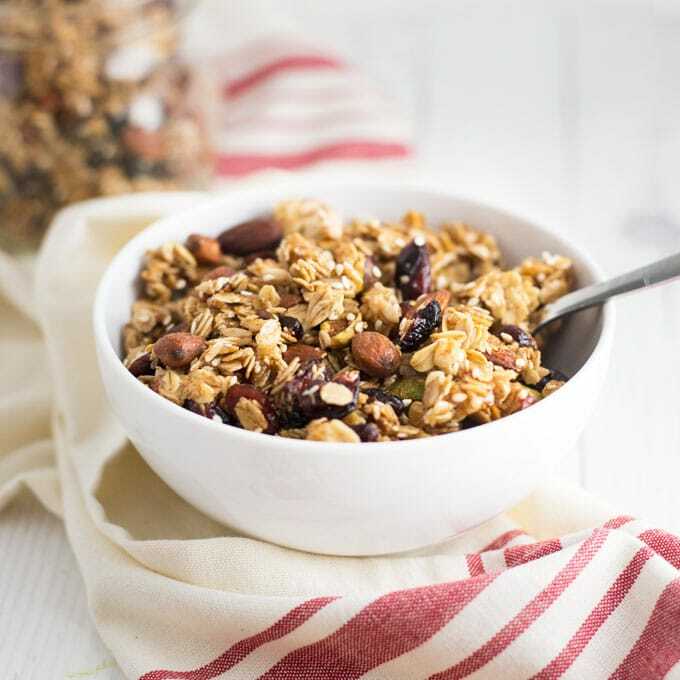 No matter how you take your granola, it’s a healthy recipe you can feel good about. This granola is naturally vegan, gluten-free, and only requires simple REAL ingredients. It’s chunky, crunchy, nutty, and sweet all bundled into little clusters. 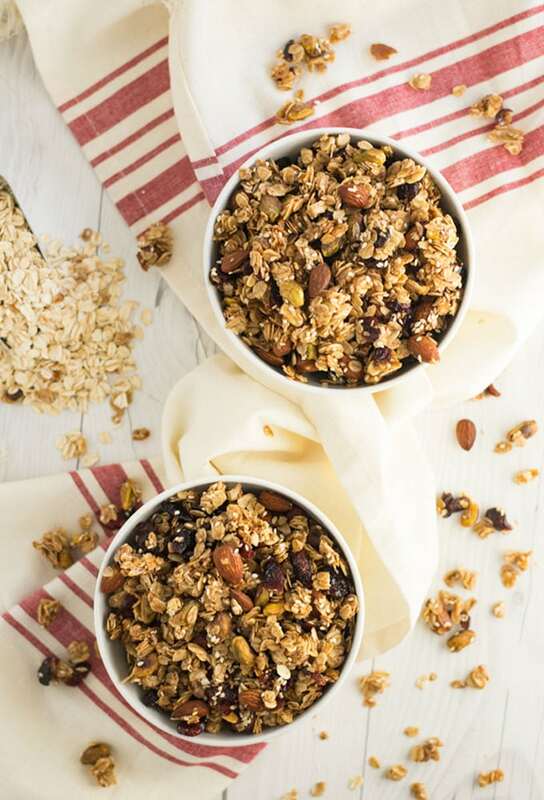 If you tried this healthy granola recipe, let me know in the comments below and share a photo using #mindfulavocado. I’d love to hear from you! Want to see more recipes? Let’s get social! CONNECT WITH ME on Facebook, Twitter, Instagram, or Pinterest to see what I’m currently cooking up! 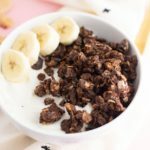 This homemade granola recipe is naturally vegan, gluten-free, and only requires simple REAL ingredients. It's chunky, crunchy, nutty, and sweet all bundled into little clusters. Preheat oven to 275 degrees Fahrenheit. Adjust oven rack to the middle. Add everything into a mixing bowl and mix well using a rubber spatula. Spread evenly onto a nonstick baking sheet. Bake for 20 minutes on middle rack. Rotate the pan and bake for 5 more minutes. Do not mix granola while baking to achieve chunky granola. I love how versatile granolas can be! Your version is so loaded with good stuff! I love the addition of the pistachios in yours! I haven’t made one in so long, I have to try your version! Yes pistachios taste so good in granola! 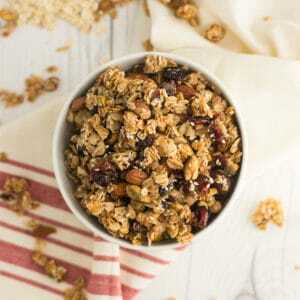 This granola looks fantastic! Would be awesome on top of a chia pudding for breakfast. I love loooove granola and somehow I never tried to make it with pistachios. I’ll definitely try your version. Thank you for the inspiration! This looks absolutely delicious and I love that you can tweek this recipe too! 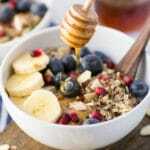 With the new year upon us I’m looking for healthy breakfast options and this will be awesome! Happy New Year!